Many of us Bolivians involved in water struggles, began to be called “water warriors” making contact with thousand of activists, researchers, defenders of water on an international level. We built and organized large campaigns to continue the defense of water. We then realized that water has different meanings: while for us water means life, for corporations and even governments it means money. It is a commodity, and all of regulations that reign over commodities applied as the representatives of the World Bank told us when Bechtel began its trial against Bolivia for having removed them from Cochabamba and losing the corporation a fortune in future income. They wanted Bolivia to pay between $40,000 to $100,000 as a punishment for the Bolivian rebellion against the privatization of water. Shame on them! They wanted us to pay for their expectations of future incomes without having invested; they wanted us to pay for their dreams of greed. The movement begun a huge global campaign to stop these unfair demands from corporate power and again we won: in 2002 Bechtel had to “sell” us their water company for just two dollars. We also faced new struggles defending the underground (fossil) water supplies in the southern highlands in Uyuni, where mining companies in the north of Chile wanted to use this water for their activities citing a Free Trade Agreement (FTA). 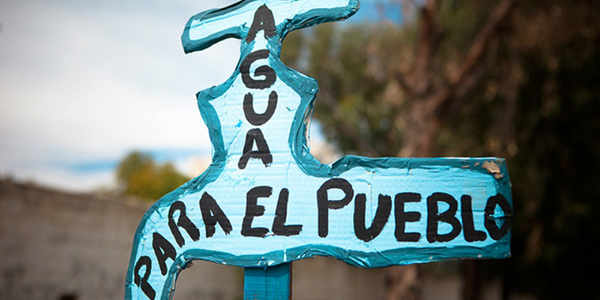 There were large mobilizations for the public water systems in La Paz and in El Alto. We took an active part in the promotion of a social vision of water management in the World Water Forums. So, between 2000 to 2010, the Bolivian people did so many things both the country and its activists. We changed our own government, we conducted global campaigns against FTAs, we took part in the popular Latin American rejection of the Free Trade Agreement of the Americas (FTAA), we struggled against corporate power, and we demanded that water and food should be removed from the domain of the World Trade Organization (WTO). We even could convinced our new government to pull Bolivia out of the International Centre for Settlement of Investment Disputes (ICSID), a private tribunal for corporations that litigate against governments in investment disputes (part of the World bank) of which our country was a member. We changed our Constitution and wrote new laws. Now our Constitution states that water is a fundamental right for life. As a nation we even promoted and made a large contribution to the 2010 United Nations Resolution on the Human Right to Water and Sanitation, a huge victory for people in the multilateral system. We helped to build a Bolivian social process. We produced a narrative, which inspires the World: the concept of Living Well and the Rights of Mother Earth, bringing Pachamama to centre stage for life. We also have been able to contribute to the struggles and narratives on climate justice and the ecological debt. We cried out to the World about the urgent necessity to reduce global warming emissions and to the North to assume their great responsibility without forgetting common responsibilities. We have to be proud of these huge victories for the Bolivian social movements and for global social struggles. But then our contradictions began to become more and more evident; Rights for Mother Earth is more of a discourse than a practical approach on the ground and we faced the fact that we really have no tools on which to build a new system (not only laws, or proposals) that both respect Human Rights and the Rights of Mother Earth. We have problems: Bolivia has a relative high per-capita contribution to climate change due to deforestation that is mainly produced by industrial agricultural corporations and by the process of internal emigration. We are also experiencing an important rate of loss of biodiversity and loss of forests compared with other countries of the region, but no one faces up to this. Bolivia has reopened its economy to monoculture agriculture, to mining and extractive enterprises in order to promote economical growth and to provide resources for social programs but, at the same time, this extractivism is poisoning our water, damaging our own food sovereignty, destroying the environment and jeopardizing human and indigenous rights. Our underground (fossil) waters which we defended in wonderful Uyuni, are now being exploited by the Japanese Corporation Sumitomo in a silver mine (called San Cristóbal) that uses 50,000 cubic metres of fossil water supplies per day. The Law on Productive Promotion for agriculture (2011) opened our fields to GMOs that are entering more and more into our food production: 98% of Bolivian soy is now transgenic. In short, the redistributive and productive schemes have become a perverse cycle, where poverty is supposed to be overcome at the cost of a vast environmental destruction. Just last May the Bolivian vice-president officially expressed the government decision, in public declarations, to begin oil exploitation in our National Parks (in the Amazon region) the biggest fount for biodiversity and water on the Continent. Although we have made many advances in fighting social injustice, colonialism and racism, there are many examples that demonstrate how this process became something we can no longer identify with, if we truly wish to go further in transforming this unfair World, the product of Capitalism and Extractivism. And there is a special keystone encapsulating this phenomenon: the TIPNIS Road scheme. Approved for completion in 2010, something officials called the ecological road, even at the time of the Peoples Conference for Climate Change and the Rights of Mother Earth, the same Bolivian leadership was officially providing their approval for the construction of the TIPNIS road through the Isiboro Sécure National Park, a territory in which indigenous communities live which is also extremely rich in biodiversity. Many people protested against it, it even provoked the resignation of the vice-minister for the environment Juan P. Ramos in July 2010, but social criticism was silent. Although we made many efforts to build a new society, capitalism and colonialism somehow always found a way to survive in a World governed by corporate interests, by the addiction to economic growth and by over consumption as a measurement of wealth, social redistribution and social justice. In this dynamic, governments and leaderships can easily become simple functional adjuncts. At some point I felt that the fighters and activists had come to inhabit a kind of large mammoth, living inside this big beast that fed itself of our energy. A place where we even think we need G.P.S. devices to orientate ourselves. We believed that our declarations, our activism and lobbying would be enough. But we were just living inside the beast of power. In that context little of our unfair relationship with Water and with Nature has really changed. This is particularly evident in the use of water for mining and oil exploitation, in the loss of forests and of environments which retain water, and in the access to clean water for the poorest indigenous communities in the highlands and lowlands which is still a great challenge. Despite this, we still believe in change. Despite this, we are still here to do our best. We can consider ourselves as survivors of the experience of being trapped inside empty words, in discourses that have been hollowed out, trapped by the substitution of action by words. Of course this is a very human mechanism that makes us believe that we are doing, when we are simply talking. But the world urgently needs us to change our paradigm from thinking to acting. We need to connect back with life and face the challenge to regain common sense in our growing cities, in mining camps, in the forests, in the countryside… in our own homes. And at the same time we need to support those initiatives where people are doing real things daily with their own hands and their own bodies for change; going beyond words. From that intense experience in my personal life I have learnt that is not enough to be from the South to defend life or Mother Earth – sometimes we tend to idealize – nor is it enough to be women or to be indigenous to have ecological or caring practices. It is not enough to have political power to change societies. We have to be very conscious to build an ethic based on an ecological and humanist vision. This change does not require cultural determinism, but rather a new civilizatory construction of consciousness. Water in our daily lives is of such importance and we tend to forget it as we think that we have just have to open a pipe to access it. I was reminded again of the complex social meaning of water when the local trade union for domestic workers produced a tiny document reminding their employees that is not ecological to tell domestic employees to wash the street on a daily basis with drinking water, or wash the car with that water, or not allow them the reuse of water for washing the dishes. So common sense again returned reminding me that when we come back home we see how much love has gone into our daily lives to make us feel comfortable and to feel loved. We are especially reminded that our homes are our mirrors. Probably it is there where love and empathy develops most. We are too used to talk about changing large realities, big scenarios. It sometimes drives us into the hands of evil powers and greed, as I have seen happen close-up. We may need to stop talking about “models of development” and begin to talk about restoration experiences and social commitments. By opening our eyes maybe we will be able to see that Water means solidarity, empathy, daily work, intimacy, self-responsibility, discipline, reciprocity, love and care. W.H. Auden is often quoted on water, saying “Thousands have lived without love, not one without water” but I always say that without love and solidarity, it will be impossible to restore the real significance of water as Life, nor will it be possible to assure clean and safe water for everybody. I am convinced that Love and Care are the “commons” we have to maintain as social values to rebuilt new societies. Thereafter, probably the most important is to develop the capacity to connect what we think with what we do; what we say with what we feel; what we live with what others feel or live. What matters is how much we care for others… for people and for nature. There are no models, but experiences; there are no receipts, but creativity; there are no heroes, just one responsibility and community ties. We need empathy, creativity and courage to keep on caring for Water as fount for Life. Elizabeth Peredo Beltrán is a Bolivian social psychologist, author, researcher and activist. She works as the executive director of the Solon Foundation and is part of the board of directors of Food and Water Watch. She is also the Bolivian promoter of the Blue October Campaign, a national mobilization to defend water as a “common”. This article reflects the personal opinion of its author. Originally posted by Octubre Azul – Bolivia here.